Senior citizen will care for your home and pets while you are away. 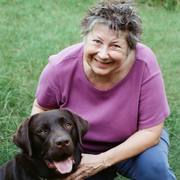 Friendly, reliable dog sitter with 30 years experience as a dog owner and dog lover. I have cared for puppies, champion show dogs, rescue dogs, and mutts. I have been through countless obedience classes with our own dogs, as puppies or rescue adoptions. Will spoil your dogs and treat them like family. Flexible hours overnight weekdays and on weekends. If you prefer your dog not eat the couch then call me to dog sit. They just want company and a friendly voice. My background check report is available upon request. Responsible, on time, professional, caring, knowledgeable, will take good care of your pets and safeguard your home. Rest and relax knowing that your pet is safe and happy in my care. Can handle special eating or medication needs. Consider me COMPANY for your best friend while you are away. Writer and photographer of doggie photo albums. We will play inside, go for short walks, or just chill. WOOF!